A new wave of designers and artisans are creating earrings that push the boundaries of jewelry design. Drawing on unique sources of inspiration to incorporate symbol and meaning, they are redefining the earring as more than a mere ornamental piece. 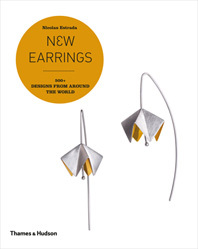 This book showcases a stunning collection of the innovative work of jewelry designers from around the world. The 500 earrings that are featured demonstrate the wide variety of techniques, practices, and resources—some traditional, some more avant-garde—used to execute these imaginative designs in a range of materials.